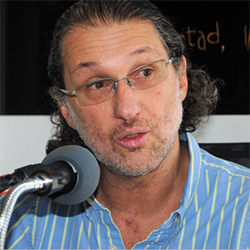 Martín Pallares has been working in political journalism since the 1990s and became one of the journalists most targeted by the president and the government during the presidency of Rafael Correa. He was fired for expressing his opinions freely on social networks and is considered one of the journalists who represents the struggle that independent journalism has fought in order to not disappear despite attempts from the Correa government. His career in journalism began in 1986 at newspaper HOY in Quito. He was also political editor of the newspaper El Universo in Guayaquil for 1.5 years and correspondent of Colombian newspaper El Tiempo in Ecuador for at least five years. From 2003 to 2015, he was editor and columnist at newspaper El Comercio in Quito. In 2009, Pallares was selected as one of the winners of the Knight Foundation journalism scholarship at Stanford University in California. He has also written for The New York Times in their English and Spanish versions.